You can see it from a mile away: the street where one automobile dealership after another is brilliantly illuminated, each seemingly trying to outshine the other. Unfortunately, much of this light is spilling off the lots, as well as being wasted upward into the night sky. While these lights serve a dual purpose of attracting potential customers and as a 24/7 security system, they devour energy! There are over 17,000 automotive dealerships in North America and on average, they collectively use up to 18% more energy annually than a typical commercial building. 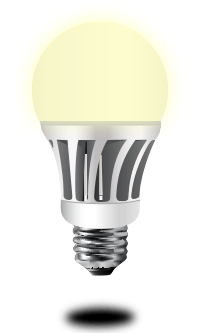 Out of the $1.9 billion spent on energy every year, up to 45% of that money is represented by lighting costs. This means thousands of dollars in energy costs for the typical dealership each year. According to E Source, energy is the third-highest overhead expenditure for a car dealership, which makes reducing electricity consumption a major consideration. The National Automobile Dealers Association (NADA) formally endorsed the US Environmental Protection Agency’s Energy Star Challenge, asking their 20,000 members to reduce energy use by 10% or more annually. The EPA estimates that if auto dealers cut their energy use by 10% (annually), they would save nearly $193 million and prevent more than 1 million tons of greenhouse gas emissions. Automakers have been marketing efficient products for years, with low-emission, high-mileage vehicles that appeal customers looking to save fuel and to buyers eager to own a “green” vehicle. Now car dealerships are taking up the banner. 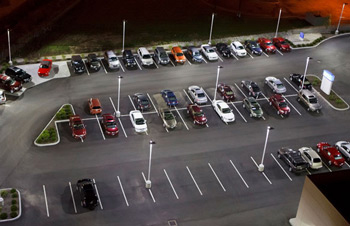 Renovations such as LED lighting retrofits or the installation of LED luminaires during new construction are an excellent way for car dealerships to begin achieving their sustainability objectives. 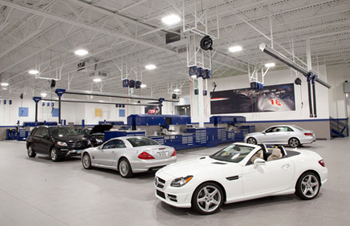 Dealership profits in 2011 averaged just 2.3%, meaning that a lighting retrofit that can reduce energy use while maintaining the quality of light you demand to highlight your dealership can make a meaningful impact on your profits. By living and working sustainably, dealerships can reduce costs, increase their brand recognition, and attract more customers.